The Festool Carvex Jigsaw was first introduced to North America back in March of 2011. It had a ton of really nice features, but the feature that caught my attention was the LED strobe light that could visually freeze the movement of the jigsaw blade. Sadly, about a month after it was announced, Festool pulled the Carvex and sent out a letter stating "...Late round testing in certain applications specific to North America has demonstrated that the current design does not meet the exacting standards that we demand of ourselves, and that our customers have come to expect..."
Like I said, the stroboscopic light is not the only cool feature. The Festool Carvex is packed full of features; from tool-less interchangeable bases that are task specific, to a triple blade guidance system that promises to eliminate blade deflection on even 4-3/4-inch thick cuts. 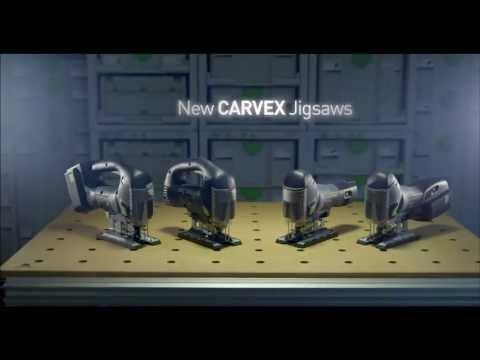 It took a couple of years, but Festool North America is finally giving us their Carvex jigsaw. This is not the same model as the one that was announced in 2011, but a newer model that is also available in Europe. Festool N.A. made a bold move by pulling the Carvex right after it was announced, but whatever the reason, I am sure they got it right this time. Look for the Carvex 420 Jigsaw this September. Tackle your most demanding applications with the robust and versatile new new Carvex 420 Jigsaw. It features multiple base plates for cutting wood, wood-like materials, plastics, and metals, adapting to your most challenging tasks. Precise - With automatic blade guidance, stroboscopic lights, and zeroclearance Splinterguards, the Carvex lets you cut straight and true, with virtually zero tearout! Versatile - A revolutionary tool-less base change system delivers the most versatile, adaptable jigsaw cutting system you've ever experienced. Durable - Brushless motors and a robust design ensure that the Carvex can handle not only your toughest materials, but the toughest conditions as well.